After reaching 68th level and finally mining enough adamantite to raise my death knight's blacksmithing skill up to 350 I take Gnomesblight to Howling Fjord to train as a grand master blacksmith and to start adventuring in Northrend. The quests given in Valgarde for Wyrmskull Village are fairly straightforward, including the follow-up quests that take me in to Nifflevar, despite only being 68th level. I quickly reach 69th level and am collecting enough cobalt to smith myself half a suit of cobalt armour, ready for when I hit 70th level, a level requirement of the armour itself. The patterns for the armour are learnt from blacksmithing skill 350 onwards from the trainer in Valgarde. I complete the hawk training quests and pretend to be a construct for a while for the Explorers' League Outpost in the east, pausing only to slaughter a bunch of turkeys for the Friend or Fowl achievement, and am subsequently guided to Westguard Keep. From Westguard Keep I bomb pirates, collect cannonballs and keep the dragon population in Ember Clutch under control. Returning from rescuing pack mules and collecting gems and ore from Whisper Gulch brings an exciting moment when I hand in the quests to reach 70th level! 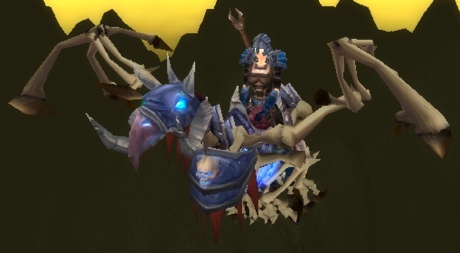 I take a break from adventuring and step through a death gate back to Ebon Hold to learn my new skills and taking the opportunity to buy the death knight-specific flying mount. Of course, I don't know how to fly it yet but a quick trip to Wildhammer Stronghold will resolve that. First, I have to borrow money from uncle Knifey. I feel kind of guilty to ask him for money but he is happy to give it to me. It seems that being in semi-retirement is working out well for him. With that little bit of extra pocket money I am able to learn how to ride flying mounts, gaining another achievement in the process, and I summon my Winged Steed of the Ebon Blade. Despite its skeletal wings and my heavy cobalt plate armour I am safely kept in the air. It is perhaps a bit of a luxury to have a flying mount at 70th level these days, considering that I won't be able to use it in Northrend until I've learnt how to fly in cold weather, but as I still need to mine adamantite to help with Sapphire's jewelcrafting profession a flying mount becomes invaluable in Outlands. As the mount also increases its speed with my own riding skill it also isn't a waste of money should I ever earn enough to learn the expert flying skill. With 70th level and a flying mount under my belt I finally feel like I am becoming fully involved in the Wrath of the Lich King. This entry was posted on 28th December 2008 at 4.21 pm	and is filed under World of Warcraft. You can follow any responses to this entry through the RSS 2.0 feed. Both comments and pings are currently closed.